Ys was originally released by Falcom on a variety of Japanese computers in 1987. It tells the story of a young swordsman, Adol, who must recover the lost books of Ys to save a troubled land. The series is still going strong, with the seventh game in the series now in production. 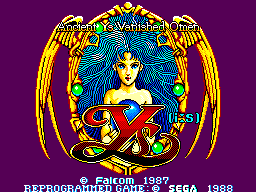 In 1988, Sega ported the original to the Master System and called it Ys Vanished Omens. 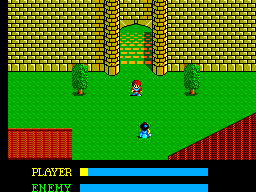 Although many people favour the Turbografx-CD port, the Master System version has the same addictive gameplay. Ys is an action/RPG, but with gameplay that is unique to the series. 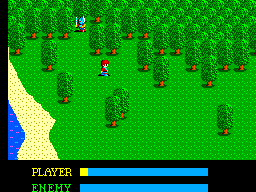 Instead of the traditional hack and slash, you simply slam Adol into the enemy. Your level, equipment and angle will determine whether you take damage or kill the enemy. It sounds boring, but when the screen is filled with bad guys, it actually gets quite addictive. There are also some RPG elements, such as level building, buying equipment and going on quests. The graphics are only slightly above average. There could have been more textures and colours on some of the areas. There are some quality character portraits when you enter a house or shop that raise this score a little bit. The Ys games have always been known for their fantastic music, and the Master System version is no different. The music for the original version of this game was composed by the great Yuzo Koshiro, who also did the music for Revenge of Shinobi and Streets of Rage. Each song is memorable and fits the scene perfectly. The Master System handles the music pretty well, but don't expect anything even close to the CD quality audio of Ys Book 1 & 2 for the Turbografx. As I said, there is no slashing in this game, unlike similar games such as Zelda. It consists of walking around and bashing into enemies. Although there aren't many controls, they are all responsive and easy to use. Equipping weapons and items is easy as well. As far as RPGs go, Ys provides some replay value, especially since the action is so addictive. It's a pretty short adventure, so playing it again isn't going to take an eternity. Ys: Vanished Omens is the best action/RPG for the Master system. It's a shame they didn't port the second chapter to the Master System, because Vanished Omens is just a prelude to that masterpiece. As it stands, though, Vanished Omens is a great game, but perhaps to short for some.